Anyone know where to get new '03 EDGE Flare Clips ? These same clips may be used on other Models but I do not know. I want to install my EDGE Flares on my Steppie and want to use new clip. Must be somewhere that sells them, I have one Fastener Site and they carry almost every automotive clips you can thinks of but not these... funny ! Ford sells them with new flares, not replacements, again funny ! Jeep ones look very similar to Ranger clips. Maybe buy a couple and see if they work, and if so buy more. I found new ones on Ebay by searching "christmas tree fastener" or something to that effect in Google images, then measured the diameter of the holes in my body panels to make sure I got the right ones. I got an entire bag of 50 for pretty cheap. Go to Amazon, punch in 2003 Ford Ranger Edge Fender Flair Clips. Company called Clips and Fasteners Inc. has them, 9 bucks + 4.65 shipping will get you a bag of 25. I would just as not use Christmas Tree Clips on my Flare, weather they look like the clips or not... just for strength sake... BUT thanks anyway ! I use "Clips and Fasteners" for other things and didn't find them on the site when I looked; I will revisit the site and see what I missed, thanks ! What? Strength isn't an issue with these. They're strong enough that you can't possibly pull them apart by hand after they're mounted. They have to be cut. I don't think mine look like that. These look like Panel Clips. I will pull the Flares and check them out before ordering. 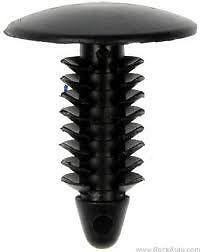 I purchased a Clip very similar to this one, from Clips and Fasteners, for my Interior Panel after Insulating the Cab, funny !